Posted on January 22, 2016 at 12:28 am. The much anticipated pokie, Guns N’ Roses, has finally arrived and if you choose to play at Leo Vegas you have the chance to win a trip of a lifetime to the USA. To win this incredible prize all you have to do is follow our links to the online casino and wager $15 on any game to earn a point up until February 24. The more points you earn, done so by wagering in $15 increments, the higher you will climb on the leaderboard. Then, the player in first place on the leaderboard at the conclusion of the promotion will need their passport as they will be jetting to the US. But that’s not all – Leo Vegas are also offering weekly leaderboard competitions for players to win some amazing prizes. There will be a new weekly leaderboard promotion run every week. As you can see there is plenty up for grabs for over 30 lucky players every week, so get to Leo Vegas now and try out the brand new pokie from Net Entertainment to win some incredible prizes. In early 2015, at the ICE Totally Gaming Conference, Net Entertainment revealed they were releasing a brand new pokie based on the global rock phenomenon, Guns N’ Roses, and since this announcement we’ve been anxiously waiting. The time has come and the pokie is now available, offering 5 reels, 3 rows and 20 paylines, as well as an opening clip of the band and a soundtrack of their famous hits for the real fans out there. 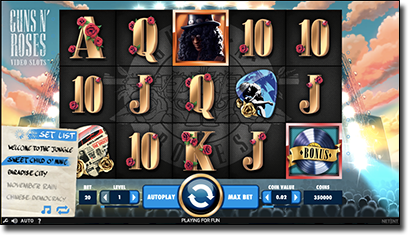 What’s more is you can pick which track to accompany gameplay including Sweet Child of Mine, November Rain, Welcome to the Jungle, Paradise City, and Chinese Democracy – this is a completely unique addition to a pokie which we have to say we quite like. Even if you aren’t a fan of the rock band or their songs, you’ll love this pokie thanks to the Wilds, Expanding Wilds, Legend Spins, Appetite for Destruction Wilds, and the Solo Multiplier. On top of this there is the Encore Free Spins where players get up to 10 free spins as well as the Crowd Pleaser Bonus Game – players enter a Wheel of Fortune type bonus and click the wheel to reveal a coin prize, and then be taken to a Pick and Click bonus. As you can see the pokie is jam packed full of special features, so get playing and win yourself a trip to the US and more at www.LeoVegas.com.